Back to “Stool,” back to “Stool,” to prove to Dad you know how to party. After last year’s hyped-up and sold-out concert, the Bartsool Sports-sponsored event, Stoolapalooza, is returning to Toad’s Place in New Haven tomorrow night. This year’s musical lineup includes several underground artists. The concert will feature Chicago/Los Angeles-based band, The White Panda, best-known for its mashup remixes such as “Shooting Superstars” (Eminem vs. Bag Raiders). Other performers include the Philadelphia duo OCD: Moosh and Twist, as well as The Soundmen, a music mixing group originally from Seattle. North Carolina hip-hop artists Eddy B and Tim Gunter were also recently added to the musical list. Doors open at 8 p.m. and the show begins at 9. Pre-concert tickets were $12 online, and are $15 at the door. According to Barstool Sports creator David “El Pres” Portnoy, the show will be a great start to the weekend. Portnoy further capitalized on the Barstool Sports phenomenon this past January with the creation of Barstool U, a sister blog solely dedicated to college students. 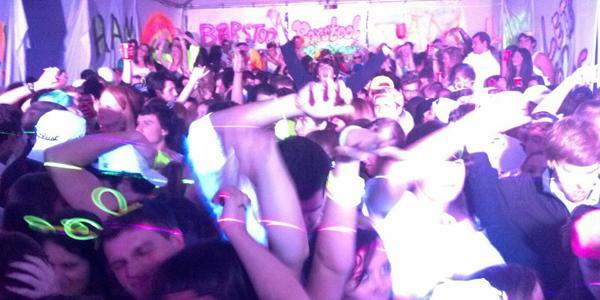 While Barstool Boston organized last year’s Stoolapalooza, Barstool U is running tomorrow night’s show. Stoolapalooza traveled to New Haven last April, after several Quinnipiac students utilized Facebook and dorm-room posters to campaign for the college tour. In addition to local acts, Boston-based rapper Sam Adams headlined the concert. Colin “DJ Tanner” Wilkinson, a health care management graduate student, deejayed last year’s event and was asked to return tomorrow night to mix a short set of tracks. Senior Denis Mitchell, aka “Denny Darko,” is a local hip-hop artist who is familiar with the current music scene. Although he didn’t attend Stoolapalooza last year, he thinks the success of tomorrow night’s show is promising. “I think we’ll see a lot of the same people that went last year plus a lot more who are more into mash-ups and the other genres that will be offered,” Mitchell said. Senior Chris McGuire attended Stoolapalooza last year, but won’t be attending tomorrow night’s show. Coincidentally, last year’s Stoolapalooza was scheduled the same night as The Fray, the Student Programming Board’s spring concert. Junior Heather Graham speculates the double-booked date focused student attention on Stoolapalooza rather than The Fray. “I think it did create more hype, more people were going to go see Sam Adams than The Fray because a lot more students at Quinnipiac are more into the rap aspect of music instead of the depressing kind of alternative,” Graham said. According to Wilkinson, ‘Stool’ ticket sales are steady. However, tomorrow night’s Stoolapalooza hasn’t received nearly the same amount of publicity as last year’s concert. With few campus advertisements and little publicity from Portnoy’s multiple blogs, the success of this year’s college tour remains to be seen.